Ex-MarkMonitor employees join new corporate domain manager. 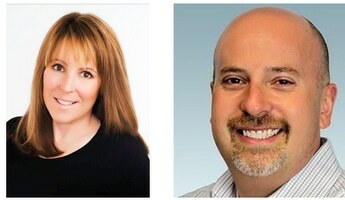 Elisa Cooper and Matt Serlin have joined Brandsight. Two former employees of corporate domain name registrar MarkMonitor have joined Brandsight, a new domain name registrar targeting the corporate market. Elisa Cooper and Matt Serlin joined the company that was founded by Phil Lodico earlier this year. It is officially launching its website today. Both Cooper and Serlin are well known in the domain name and ICANN communities. Cooper left MarkMonitor in 2015 and joined intellectual property company Lecorpio. Lecorpio justed merged with IP firm Anaqua, so Cooper made the move to Brandsight. Serlin’s name is well known because he was listed as the contact on about 35,000 domain names that MarkMonitor registered on behalf of clients that wished to remain anonymous. He left MarkMonitor earlier this year. So, is BrandSight going to take on BrandBucket?